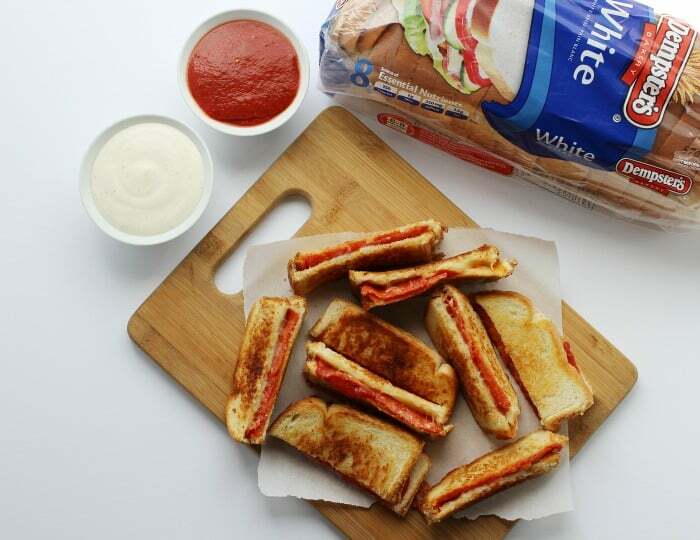 You’re going to love these easy pizza grilled cheese dippers. If your home is anything like ours, it is always buzzing with some excitement. 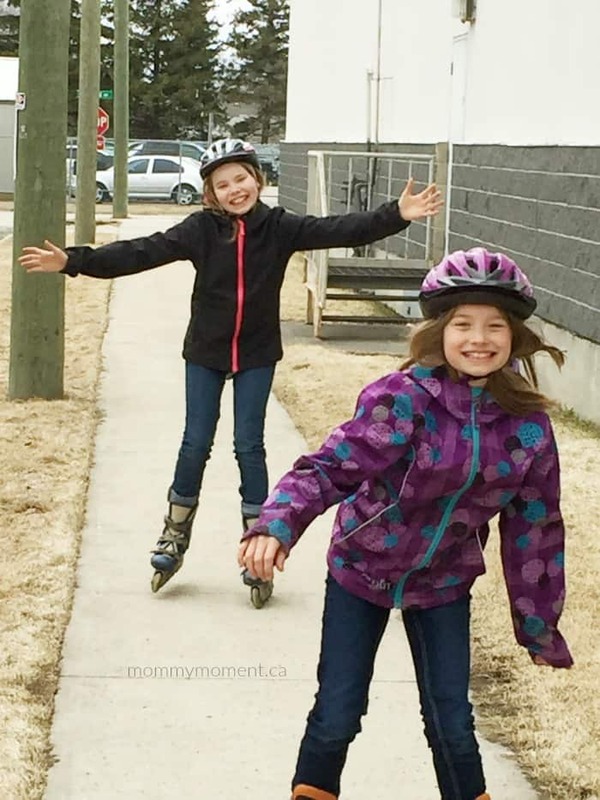 Whether we have just come in the door from taking the girls rollerblading in the park, or finished yet another card game, or had unexpected friends drop by for a visit, I need to have some quick and easy meal ideas on hand that the kids will love. I was telling my girls that National Grilled Cheese Day is coming up on April 12th and they were giggling as they shared some extreme ideas of grilled cheese sandwiches we could make. That would be a mighty big sandwich for a little kid! After the laughter had died down, I told them it had to be quick for busy moms to make and something that would be easy and fun for kids to eat. 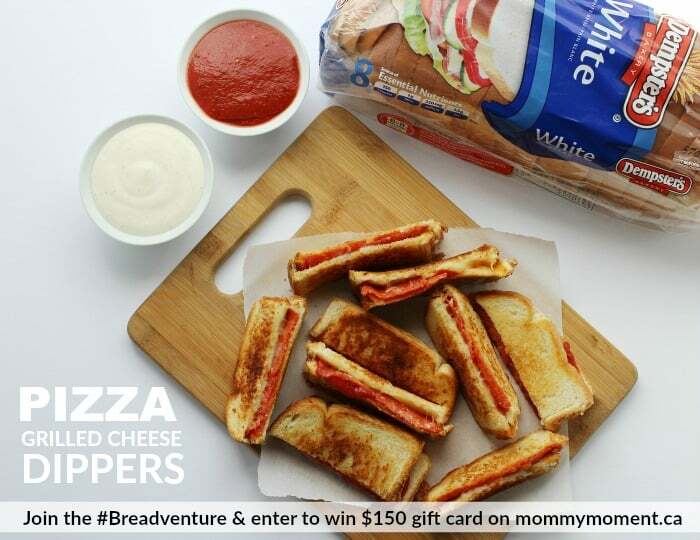 We agreed that Grilled Cheese sandwiches and pizza are both loved by children, so why not be adventurous and combine the two for something extra special. I have to admit that it took me three tries to get the recipe perfected, but we did it, and we can’t wait to share our creation with you! The first step in making a delicious grilled cheese sandwich is finding the perfect bread. 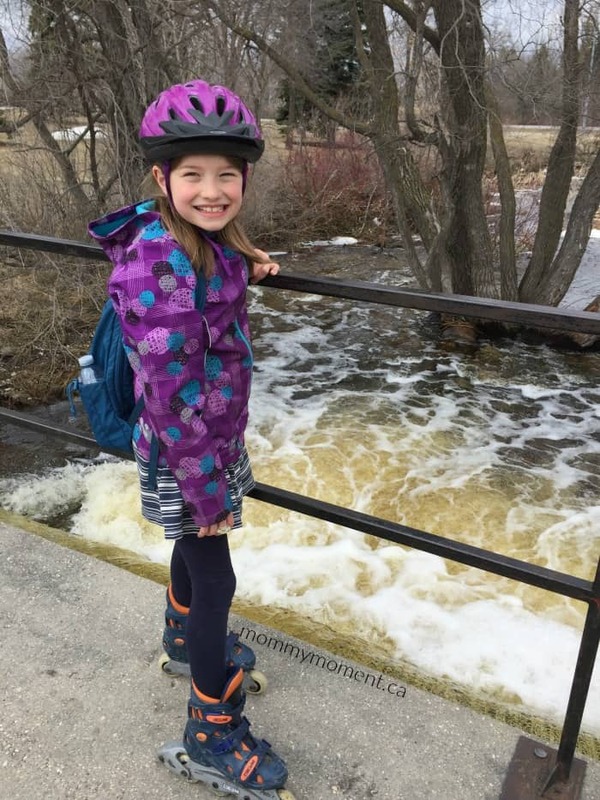 Dempster’s White Bread has always been my family’s favorite and I love as a mom to be able to pick up bread from a trusted brand and know the kids will love it too! Here is a Dempster’s Coupon for you when you pick up your ingredients. These Pizza Grilled Cheese Dippers are easy for mom to make in a hurry, and they are a hit with the kids! Butter all 4 slices of bread and place bread buttered side down on medium/warm griddle. Put shredded cheese on each slice of bread. 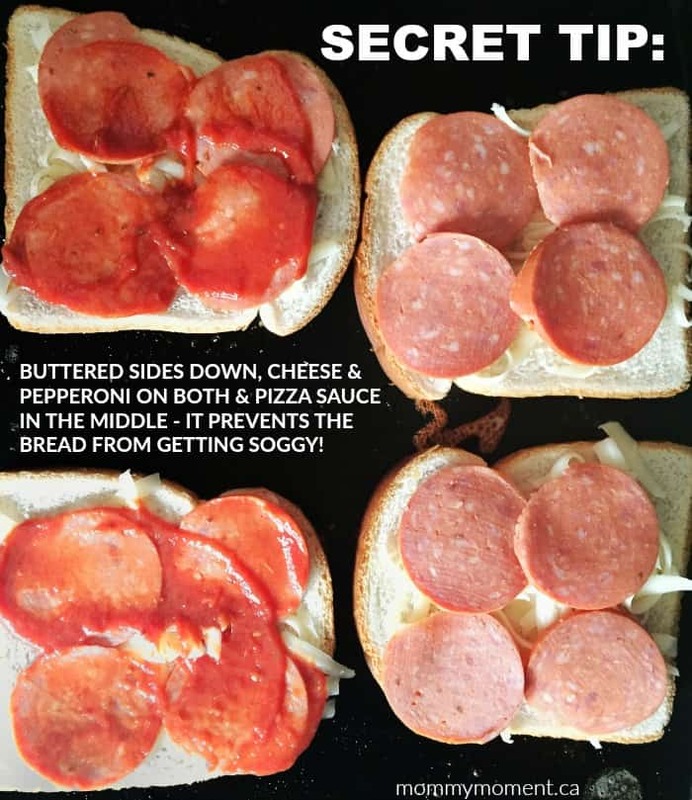 Add 4 slices of pepperoni to each slice of bread. (If your kids do not like as much meat, add 4 slices of pepperoni to only 2 slices of bread, but be sure to add cheese to all the slices). Add 1/2 tbsp of pizza sauce on 2 of the slices of bread. When the cheese begins to melt and the bread begins to brown, flip one side of the bread with the pizza sauce onto one of the slices with no pizza sauce. The pepperoni should stay in place as you flip it because the melted cheese holds it on. The pizza sauce stays in the middle of the sandwich instead of directly on the bread, which prevents the bread from getting soggy. 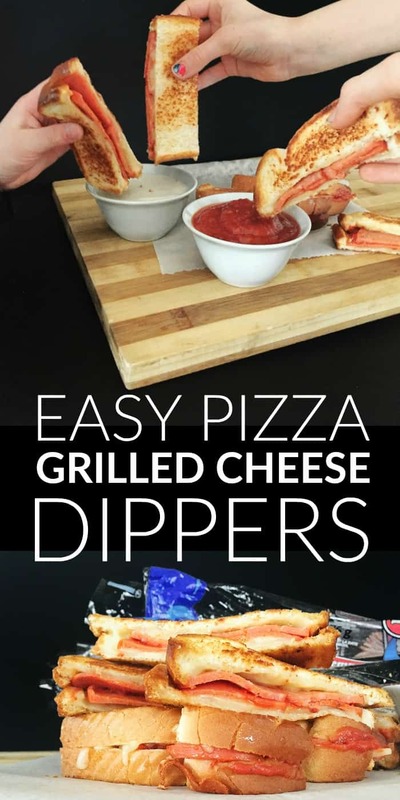 I use a pastry knife to cut each sandwich into three dippers, so this recipe makes six grilled cheese pizza dippers. Dempster’s white bread is perfect for this recipe. Get your Dempster’s Coupon here. Can’t go wrong with a toasted tomato and cheese sandwich! For my breadventure, I think I would try the egg in a hole sandwich! I would make a grilled cheese sandwich, it’s my favourite! I would make a grilled cheese and ham sandwich. I want to try the taco grilled cheese sandwich! I would love mine with turkey, bacon, tomato, lettuce and a slice of swiss cheese!! For my #breadventure, I’d love to make a bacon and egg grilled chees! I would make a grilled cheese sandwich with jarlsberg and turkey bacon! For my breadventure I would make a steak and three cheese melt sandwich-YUM! For my breadventure, I’d love to try to make a Banh Mi sandwich. Tomato cheese melt is a classic and a favourite of mine! The turkey, brie and asparagus panini looks delicious. I would try that one out. I would love to try making the California 12 Grain it looks delish! Usually I would make avocado, bacon and cheese. I love the idea of the Turkey, Brie and Asparagus Panini on the Dempster’s page. I have never tried asparagus in a sandwich but tat is about to change. I love to make all kinds of warm fish + cheese sandwiches. I would make a grilled cheese and tomato sandwich. My sandwich would have ham, pepper jack cheese, baby spinach, sweet pepper, spicy mayonnaise. yummy !!!!!!!! I would love totry and make a pizza sandwich! I would love to try the Crunchy Tuna and Radish Salad Sandwich for my #breadventure. I would make an avocado club or a reuben! I would make these pizza grilled cheese dippers because my boys would just love them! Thanks for the recipe and for the chance to win! My #breadventure sandwich would be a toasted bacon and tomato sandwich. So good! I would make a fancy grill cheese with 3 types of cheese. I’d make a grilled cheese with apple and bacon. the grilled cheese nachos look interesting! I'[d make a roast beef, tomato and mayonnaise on Dempsters Golden Grains Rye bread. I would make a grilled cheese with tomato and bacon. I would make a BLT!! I would try the taco grilled cheese. I would make grilled cheese with bacon. I would make a cheese and ham sandwitch! I would make grilled cheese and tomato. I would make a grilled cheese and back bacon sandwich, I love grilled cheese sandwiches. I would make a Tuna sandwich with Red Cabbage for my #breadventure. A grilled Cheese sandwich with lots of dill pickles!!! I love to eat tuna salad sandwiches on Dempster’s naan bread. I love tuna mixed with red onion, celery and whole grain mustard and mayo…that is my #breadventure! Egg-in-a-Hole- Sandwich sounds yummy for breakfast! Great coupon! For my #breadventure, I’m going to make turkey, brie and apricot melt. Yummy! My #breadventure would have swiss, turkey and sprouts. I would definitely make a fried egg sandwich with shredded cheddar and crispy bacon on Dempster’s bread! I love grilled cheese and bacon with a side of tomato soup. I would make the Turkey Brie and Asparagas Panini, it looks delicious! The Frank & Beans Hotdog sounds so good for a BBQ party! I’d make a grilled and ham cheese sandwich. I love getter no creative with Grilled Cheese sandwiches . Mine would be Brie wth Mustard and a sprinkle of Worcestershire Sauce . Grilled Monterey Jack, red onion and sliced torkey. I would make a hot BLT sandwich!! I would try Turkey brie and Apricot melt. For my #breadventure I would toast the Dempsters Bread and put scrambled eggs, tomato and top with cheddar cheese and broil until all melted and cheesey good. Oh now I’m hungry 🙂 Thank you for this great giveaway !! I love a grilled cheese with onion. I love a toasted BLT sandwich for lunch. The Taco Grilled Cheese Sandwich sounds awesome! I would make a toasted tomato sandwich. Preferably with a home grown summer tomato. I wld make a cucumber sandwich for my #breadventure. Next bread adventure would be a hot turkey sandwich with bacon n tomato n cheese on delicious DEMPSTERS bread. I still love my grilled ham and cheese! To make it extra crispy I spread mayo on the outside of the bread instead of butter. Yummy! I would make a Bacon Lettuce Tomatoe Toasted Sandwich. I love a basic meal. I would make a simple grilled cheese sandwich! For my #breadventure, I would choose the Turkey, Brie and Asparagus Panini. I would love a grilled cheese sandwich with bacon!! I would make a maple bbq pulled pork grilled cheese for my breadventure! I would make a Chicken Parmesan Grilled Cheese. Salami, cheese, onion, pickle, and mustard! Egg Salad is my fav…. I would make a grilled cheese and bacon sandwich. The sandwich I think I would make for my #breadventure would be the Grilled Eggplant Caponata with Raisins and Pine Nuts! I would make a peanut butter and jelly sandwich for my breadventure! I would make a grilled cheese with lettuce and tomatoes and lots of cheese! I’d make a fried egg sandwich topped with fresh tomato and avocado for my #breadventure!! The Three Cheese Mushroom Melts #breadadventure sounds so delicious.I would love to try this sandwich. A toasted bacon and tomato sandwich! 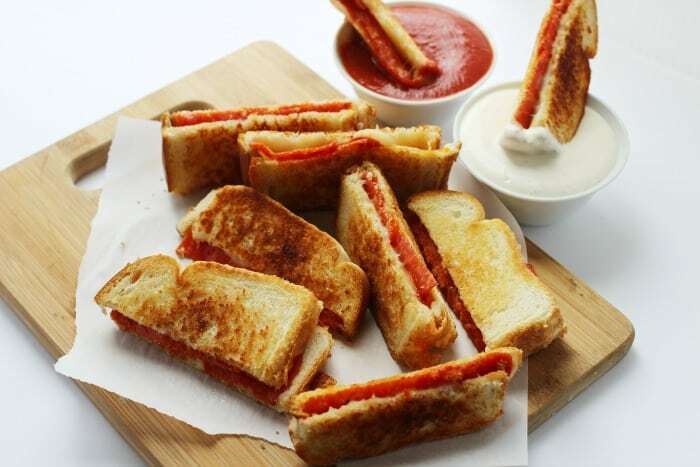 The pizza grilled cheese dippers ! I would make a grilled swiss, bacon and tomato sandwich. I just saw a Taco Grilled Cheese on another site that looked amazing! My sandwich would have hummus, raw red peppers, salad, and a dash of sweet Thai chili sauce. I would make the Avocado Chicken Curry Bagel Sandwich for my #breadadventure. I’d love to try the Southern Chicken Bagels. For my #breadventure, I would make a tomato and bacon grilled cheese sandwich. Taco Grill cheese I want to try it! I would make a bacon,mushroom,tomato and cheese sandwich! I would love to try the Tuna Sandwich with Red Cabbage. The sandwich I made for dinner a few nights this week – Dempsters bread, mayo, mustard, salami, lettuce, tomato with pink salt and pepper, and gouda.. And a few dill pickles. Yum! I would make tomato and bacon #breadventure. I would make a grilled sandwich with Spanish onion. I’d make the Turkey Brie and Apricot Melt! I think I would make Egg-in-a-Hole Sandwich for #breadventure. I can’t claim the coupon as I don’t have a working printer but I would make a monte cristo sandwich! My #breadventure would include cheddar cheese, bacon, avocado and ketchup to dip with! I would make a grilled cheese and bacon for my #breadventure. I’d make Breakfast Sandwich Grilled Cheese! I’d make the Dempsters Turkey Brie and Apricot Melt, the picture made me hungry! I like a grilled Cheese with ham. Grilled Cheese and Pepperoni sounds great! I would make grilled cheese with bacon for my #breadventure. Just used Dempsters to make a grilled cheese and bacon sandwich! I would make a yummy grilled cheese sandwich! I would make a triple decker grilled cheese sandwich with bacon. My favorite is definitely Grilled Cheese! I would make a fried egg and cheese sandwich. SO yummy! I’d make a turkey, bacon, tomato sandwich. For my #breadventure I would make a juicy ham (left over Easter dinner), tomato and sharp cheddar grilled cheese. I also love grilled cheese with dill pickles! A basic favourite of a BLT…We like doing the bacon on the bbq! In our house we always love Dempster’s Bread and we enjoy making grilled cheese with a slice of tomato and bacon on it. so so yummy!! #breadventure. I would make my favourite BLT sandwich #breadventure. I would make a Brie and apricot jam sandwich! Love getting creative with grilled Cheese ! Brie with Mustard is a fave , I also love colour so lots of Red and Green Peppers and Basil with an extra Strong Cheddar . I would make Bagel Pizzas! I never thought of a pizza grilled cheese before. Brilliant! I would make a a mushroom grilled cheese. For National Grilled Cheese Day, we are going to enjoy our #breadventure with grilled cheese sandwiches filled with melted cheddar and a hint of mustard. Once grilled I open the two pieces of bread to insert either ham or turkey deli meat and a slice of fresh tomato. We get our protein, carbs and veggie in a quick meal. I would like a cheese and bacon grilled sandwich. My favourite way is for Grilled Cheese Sandwiches or Patty Melts! We have grilled cheese sandwiches quite often. I like to make my sandwiches with cheese on the outside and inside and then after it’s grilled I add avocado and either cucumber or tomato. A classic bacon and tomato sandwich! I love Grilled cheese, bacon and avocado! I would have to go with a grilled cheese on a multi grain bread and either Swiss or havarti cheese and a wee bit of sirachi sauce sprinkled over! I would make a grilled cheese with sliced apples on Dempster’s® mild light rye bread. Favourite sandwiches around here are grilled pizza sandwiches or tuna melts so we would make either of those or both! I would make a brie chese sandwich with sliced tomatoes, using Dempster’s Harvest Pumpernickel bread. I would make a Honey Side Up Breakfast Sandwich. For my #BreadVenture I would probably go with an old fave – grilled cheese with tomato and bacon. Mmmmmm delicious! But I do like to mix it up a bit. Bacon, brie, turkey and avocado is always a treat so many different options. #breadventure Apple Pie Ice Cream Sandwiches – I didn’t even know those were a thing until that front page recipe popped up #uhoh #nomnomnom #healthychoicecuzitsDempsters! This looks delicious! To be honest, I would probably make this! I’d love the Mile High Manwich! We like the basic grilled cheese with soup and vegetables on the side. omg the Turkey Brie and Apricot Melt sounds divine!! I would love to make the Blueberry & Almond Butter Plain Bagel. I’d make a grilled cheese with bacon! I’d like to try bagel pizzas from the recipe section. I love bagels! I’d make a toasted tomato and cheese sandwich with mayo and black pepper. Yum! My #bredventure would be French Toast Roll Ups. That Fully Loaded Breakfast Bagel on their site looks amazing! I would try the Turkey Brie and Apricot Melt for my #breadventure. Toasted Bacon, Lettuce and Tomato for me. For my #breadadventure I would make the sandwich I had when I was 17 at the Hard Rock on Oahu. It was loaded with avocado, had papaya and mango slices, these awesome bean sprouts , had this creamy dill pineapple sauce, it was so good . All vegetarian and was the weirdest but best combo of fruits and veggies I ever had. i would try a grilled chicken mozza pesto cheese!!! Some great dinner inspiration! Soup and sandwiches for dinner tonight!